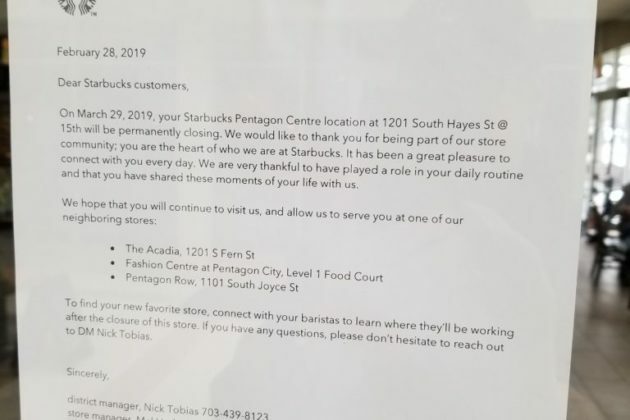 Starbucks is closing one of its Pentagon City locations later this month, according to a sign posted on the door. The Starbucks, located on 1201 S. Hayes Street, will shut up shop on March 29. The coffee shop is located at the Pentagon Centre development, also home to the area’s Nordstrom Rack, Best Buy and Costco. “We are very thankful to have played a role in your daily routine and that you have shared these moments of your life with us,” wrote managers Nick Tobias and Mel Huth on the goodbye note taped to front door. Mall rats and Metro users will not have to travel far to get their caffeine fix, however: the chain’s other stores located inside the Pentagon City mall, on 1201 S. Fern St, and S. Joyce St. remain open. The billion-dollar company announced it would be closing several of its 50 D.C. stores earlier this year, citing slowing sales in a company memo, reported WTOP. 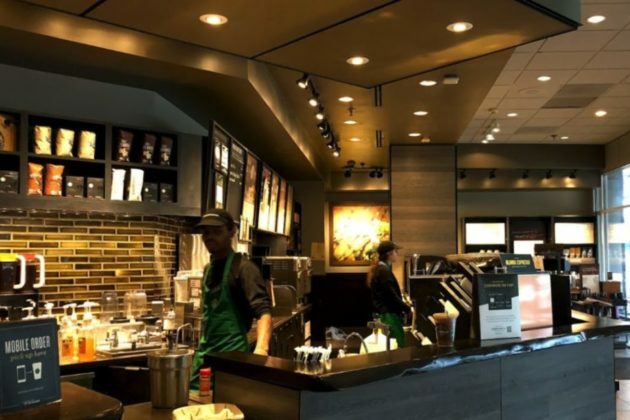 By mid-February, Starbucks stores on 1201 Connecticut Ave NW, 21st and P Street NW, 9th and G Street NW closed and a fourth on 2300 Wisconsin Ave is expected to close by the end of the month. The chain typically closes 50 stores per year, but announced last June it would be shutting down 150 this time. CEO Kevin Johnson cited expenses from the incident at a Philadelphia store last year when two African American men were arrested while waiting for a friend to show up at their Starbucks. Former-chariman-turned-presidential-candidate Howard Schultz said the anti-bias training offered to store employees nationwide after the incident went viral cost Starbucks “tens of millions” of dollars. H/t to Ben C. Photo 1 via Google Maps.